There are a jillion of these how-to books on the market, and all have helpful things to say. However, the advice in these books is spot-on, and they include helpful sample essays and are inspiring to read. Both are available at Amazon.com and are inexpensive. Reading sample essays is one of the best ways for students to get ideas for topics for their own essays, as well as get a feel for the more casual style and tone of these pieces. 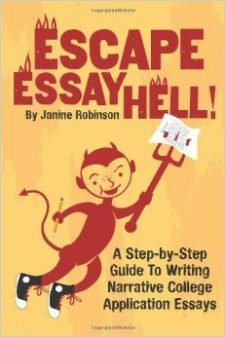 I also believe both authors do a good job of taking some of the pressure off these dreaded assignments. The Harvard collection also includes wonderful analyses at the end of each sample essay.